Offering the finest level in both finish and construction a Malo yacht is a true quality cruising boat. Leif Ängermark design combined with the renowned Swedish standards results in one of the best forty foot boats on the market. 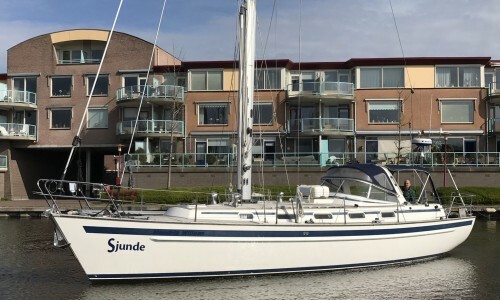 SOZO has been professionally maintained and benefits from light usage plus a good specification, viewing is a must for those in the market for a pedigree cruising yacht. Lying ashore in Poole and ready for inspection, viewing is highly recommended. 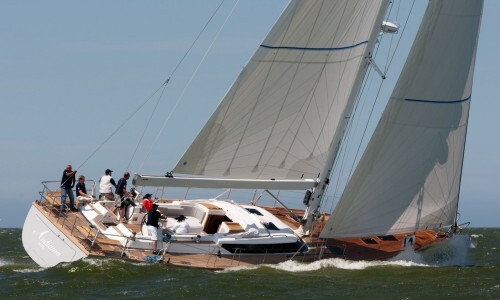 Malo Yachts are known for their high end build quality. A balsa core sandwich provides strength and rigidity whilst framework of transverse and longitudinal bulkheads are laminated directly inside the hull to further adds to the robust build. Both the hull and deck are bolted and laminated into a single unit preventing movement between the two. Accommodation below offers the same standards and the joinery alone proves that, whilst labour intensive, Malo yachts are built to last. The deck layout is spacious with ease of use underway primarily in mind. A raised gunwale line and guard rails surround the boat including across the transom. Forward the anchor and winch is flush to the hull with easy handling and access to the mechanisms for servicing. Stainless cleats, including at midships, are fitting along the top of the gunwale. Sheets are run back to the cockpit to meet four winches, two electric, with a further winch plated to the mast. The cockpit is deep with large locker space for generator and equipment storage. A cockpit table is fitted and foldable providing extra space when underway. A large windshield provides protection whilst maintaining excellent visibility. 1 x Andersen 28ST two speed winch fitted to mast. 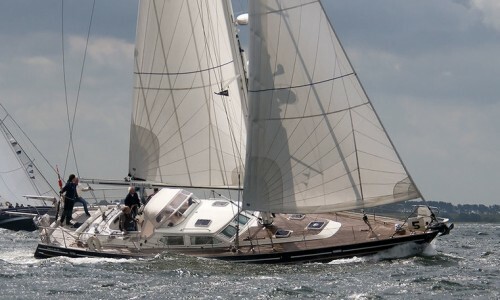 A furling mainsail and headsail mean SOZO is a pleasure to sail even when short handed. Sails are original however laundering and lighter usage has kept them more than serviceable. 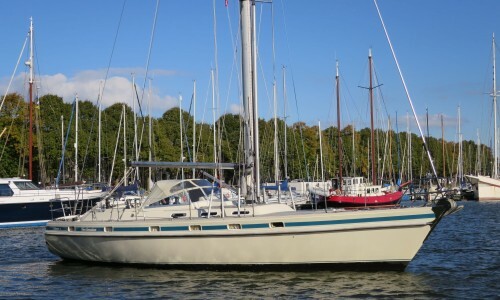 A high mast and fractional rig with two pairs of spreaders ensure the both is both powerful and well balanced under sail. 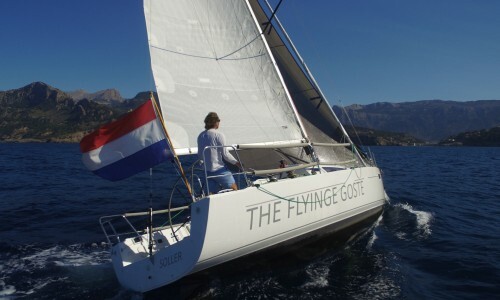 Spars are Selden made and the mainsail traveller is fitted over the cockpit on an arch. Raymarine instruments and repeaters are all fitted in the cockpit for easy usage when underway. The chart plotter is seated in it's own fitting on the starboard side of the coach roof whilst the other instruments are above the companionaway. A single repeater is fitted at the helm position along with the steering compass. Raymarine Chart Plotter with specific cockpit fitting. Fitted with a reliable 54hp Yanmar Engine SOZO will comfortable cruise at 7kts. When under sail a folding propellor further increases performance. The boats 12v system is controlled from a switch panel at the chart table with the shore power/AC breakers in the cockpit locker. Also fitted in the cockpit locker is a Dometic diesel generator. A smart charger is fitted and will charge through the engine alternator, generator or shore power inlet. The boat has been professionally maintained throughout its ownership. Access to the engine is through side panels and removable companionway steps. Heating with blower throughout accommodation. Below decks you are immediately greeted with a light and airy space. 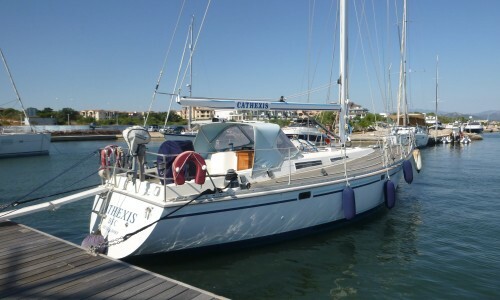 To port is the aft Cabin, offering a large double berth with ample storage. Forward of this to port is the galley area. The gimballed cooker unit has an oven and grill. Locker space is above the worktops with a top down fridge unit in the corner. To starboard is the aft heads with shower. A large mirror and well positioned marine head offer a comfortable space when both underway and in harbour, further locker and storage space surrounds the sink. The same theme of well utilised space continues through to the chart table area and saloon. A full switch panel for the electrical circuits is at eye level along with VHF radio, CD player and other navigational equipment. The lifting chart table offers space for charts and draws are built in beneath. The saloon space is centred around a large table with a settee surrounding it to port. To starboard are two large chairs offering a change to the usual settees. A nice touch is the small bar space between the chairs which adds to the relaxed nature of the saloon. Surrounding the saloon are lockers plus there is extra storage beneath the settees. Moving forward into the cabin is a large double berth with hanging lockers and reading lights. Another marine head, with a shower and curtain are again well positioned for usage underway and in harbour. SOZO is fitted with a full pressurised hot and cold water system servicing the galley and both heads. Lighting is a combination of reading lights and overhead lighting however large well positioned hatches allow ample natural light below decks. 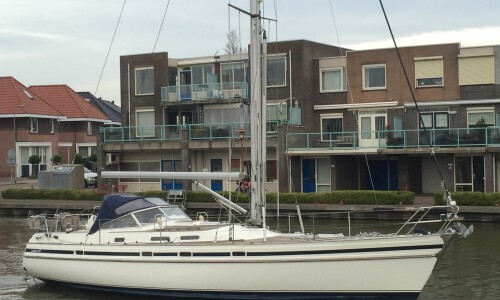 In general, the Malo 40 offers a combination of space and comfort unequalled by many similar sized yachts. 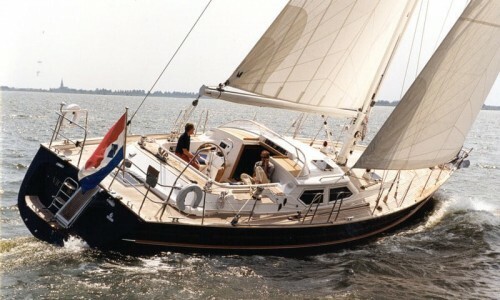 The joinery, layout and individual touches offered on this yacht make her ideal for extended cruising.